I thought I'd share some details and a few recipes from the cocktail party we hosted for our friends a few days ago. The actual gathering was on July 5th but I still stayed with the patriotic theme. We served assorted sandwich wraps, California rolls and sushi, tomato pie, artichoke and spinach dip, macaroni salad, vegetables and dip, shrimp cocktail, and mini soft pretzels. For dessert we offered brownie bites and mini pies served in half pint Ball jars. The mini pies were a huge hit, some people even took them home. The recipes below can make about 12 pies each. I found a few recipes online for the mini pies and sort of combined them all together. For the crust I used Pillsbury prepared crust versus making my own. Place cherries (and juice) into a small saucepan. Stir in the sugar and cornstarch. Bring to boil over medium high heat, continuously stirring. (The sauce will be thickened after about 8 minutes.) Turn off heat and add almond extract and food coloring. Stir well. Place hot filling into a medium size bowl and let cool. In a medium saucepan, heat 1-1/2 cups blueberries, zest and juice over medium-high heat. Stir frequently, and allow the sauce to reduce a bit, until it coats the back of a spoon. Cook for about 10 minutes. Remove from heat and combine in a medium bowl with the fresh berries, sugar, salt, and tapioca. Set aside while you prepare the jars. A few tips: I found that buttering the jars helped the dough not stick to the sides when eating. Working with the dough at its coldest makes a flakier crust. I worked in batches of 6 jars, any more would have taken too much time and let the dough get warm. I also cut a few mini stars from the remaining dough with a cookie cutter and placed them on top of each jar prior to baking. Here is a good picture of the pre-party controlled chaos! I learned a little party organizing trick from one of my favorite aunts who is a pro at throwing huge, well planned parties. She is just amazing to watch and I try to learn from her each time! We start with a menu and then create post-it notes for each menu item. Then we place the notes onto each serving piece to help us (and you know that person who always asks "what can I do to help?") right before the party when running the final checklist through our heads. This makes certain we have all the menu items covered and that there is a serving dish for each item! I do it for every holiday and event we host! Another good recipe I found was Rachael Ray's White Sangria. We basically multiplied the recipe by 8! It was well received by our white wine drinkers. We transformed the dining room into the beverage area, and had all of the food placed in the kitchen. This virtually assured that people would make it into the dining room! 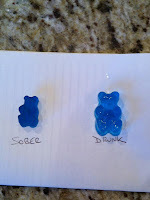 Searching through Pinterest (by the way, find me here on Pinterest) I found the idea to serve 'Drunken Gummy Bears". Who knew! I found red, white and blue gummy bears on Amazon. 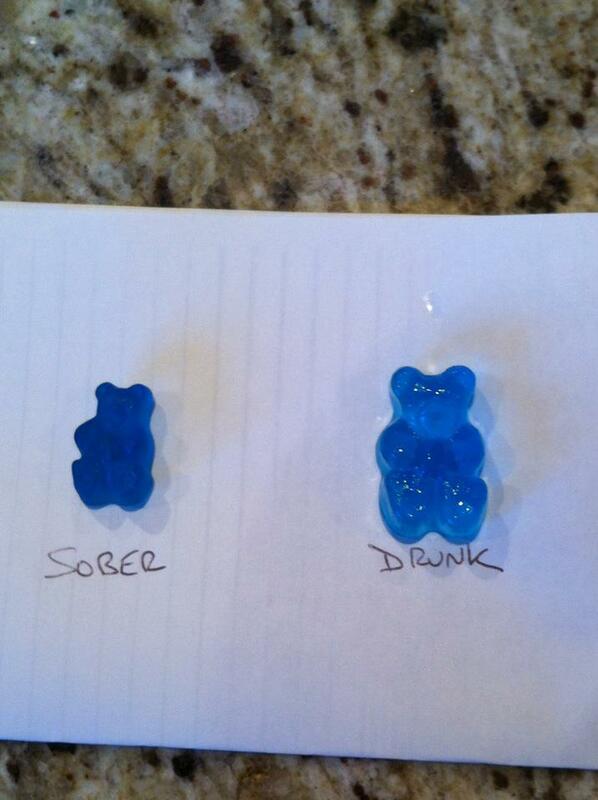 I divided the bears into different containers and covered them with vodka for 5 days. Each day I gave them a check to see if they were covered completely. The day of the party I used a slotted spoon and put one gummy into an individual plastic shot glass. Believe it or not, these were a huge hit. Personally I did not try one....not a shot type of person, but they sure were cute and they had people talking about how large they became by soaking!